As most energy brokers know, the deregulation of energy has driven a sharp increase in opportunities for energy brokers. But are you keeping up with the rapidly changing competitive landscape? The industry's growth means competition gets fiercer by the day. Technology is changing and standards are transforming. Business practices that were successful a few years ago might not cut it in today's energy market. 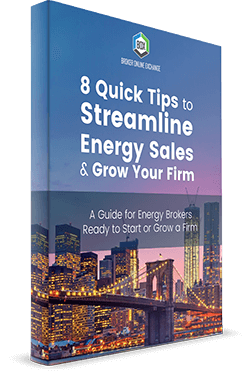 In this eBook, we'll discuss some modern best practices for energy brokers that will allow you to streamline your business to maximize sales and growth. Streamline Your Energy Sales Today! Complete the Form to Download Your eBook.